In order to expand their horse business, Darrel and Marlene Griffith built a 5 stall barn and later a 10 stall indoor riding facility. Marlene Griffith shown aboard Frosty, lost her husband Darrel in 2014. She spent her life training horses with him. 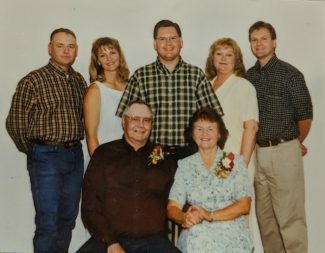 Darrel and Marlene Griffith, at front, are flanked by their five children. 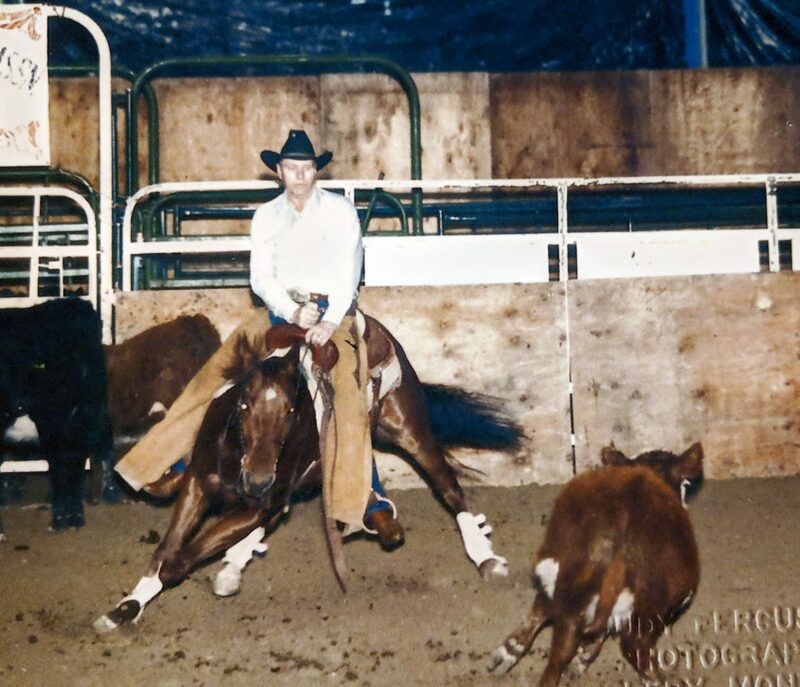 Darrel Griffith taking first place in a reining competition. 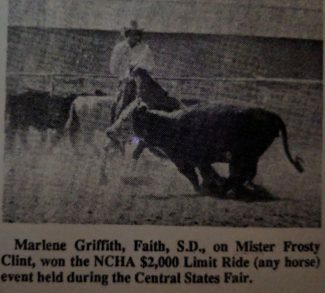 Wishing aloud that her late husband was still here for their honor, Marlene Griffith accepted South Dakota Quarter Horse Association's trainer recognition on behalf of herself and her husband Darrel Griffith Jan. 12 in Pierre, South Dakota. 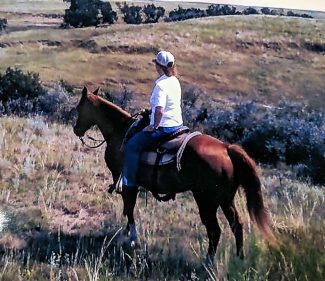 They made their home near Faith, South Dakota, on Darrel's family's ranch and developed a booming horse business with a one year waiting list for outside horses. "I am just so tickled that, as there seems to be more horse trainers in the area and more indoor riding facilities, they are actually remembered for the lives they touched through horses," said Griffith's daughter, Terri Kissack. "To have the association go back and remember the impact they had on people's lives, I'm just so grateful." After Darrel passed away in 2014, Marlene moved to Spearfish, per Darrel's wishes. 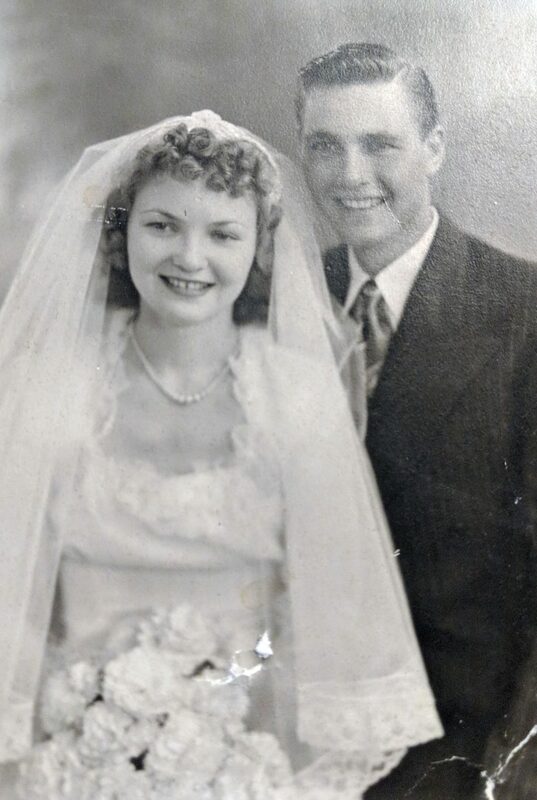 Prior to that, the two had been inseparable since meeting in downtown Faith, where Marlene was riding her bicycle around town with a friend and Darrel was driving around. That day led to their marriage two years later in 1950. They worked horses, cleaned stalls, and raised five children side-by-side. Marlene was willing to do whatever it took for her husband to succeed in his God-given gift of training horses, Marlene said, even if that meant she had to be the "cow" while Darrel was training a cutting horse. As newlyweds, the Griffiths bought a house from the small neighboring town of Red Elm and moved it out to the ranch. Darrel and Marlene purchased 15 heifers from his parents to get their start in the ranching business, all while growing the horse business. Darrel got his start by riding to the neighbors to see if he had any horses that needed broke to ride. A deal was struck that if the neighbor didn't like what he saw, he wouldn't need to pay Darrel. After a month, Darrel rode the neighbor's horse back, ponying his own. He ended up getting paid and ponying another of the same neighbor's colts back to the ranch, and so began his horse business. "He took in a lot of colts to break, a lot of cutting horses to train, roping horses, barrel and pole horses; he trained for just about anything they wanted, but cattle cutting and breaking colts mostly," Marlene said. As their cattle herd grew, they continually expanded their horse herd as well. Major Mike, a blaze-faced sorrel stallion, became the center of their Quarter Horse program for some time. He was athletic and a "bit of an outlaw," Kissack said, "but raised pretty, good-minded colts." 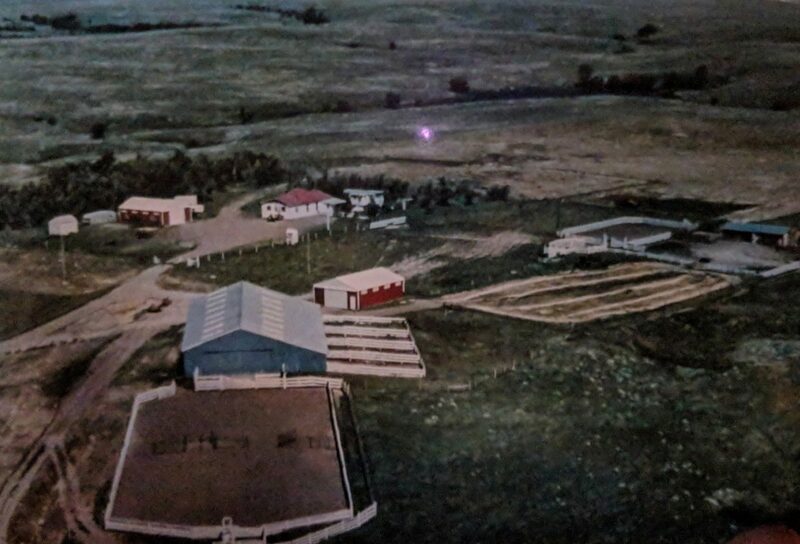 Darrel showed outside horses as well, earning AQHA points in cutting, reining, and halter with Babe Cody, and the SDQHA high point senior reining in 1962 with a horse named Mexico Jr. They ended up beating the current World Champion reining horse two years in a row. Through the years, Darrel and Marlene's original herd of Hereford cattle slowly transitioned to Black Angus. "Later on, we got two or three longhorn bulls and bred the heifers to them because of the easy calving. They just hit the ground and would take off. They were so lively and small," Marlene said. When riding a horse outside one winter day, the horse slipped and fell, landing on Darrel's leg, breaking it. Marlene retrieved pieces of wood to steady the break, then, with the help of a neighbor, loaded Darrel in the car to head for the doctor in Rapid City. The pain was so great that Darrel asked them to stop at the Municipal Bar in Faith and get a bottle of whiskey as there was no doctor in town to get him pain medicine. "When they got to the hospital, they asked him if he needed a shot for the pain, to which he replied, 'No, thank you. I've already had a couple shots,'" Kissack said. The break required a plate and screws to mend it, and a friend told Darrel that if he was to continue training horses for the public, he needed to build an indoor facility. In 1966, they erected a 60 by 120' indoor arena with 10 stalls and runs. As business grew, they decided to sell the broodmare band, enabling them to concentrate on ranching and training. With a thriving training business, Darrel and Marlene purchased the ranch supporting their growing family of five children, Debbie, Jim, Terri, Doug, and Rick. 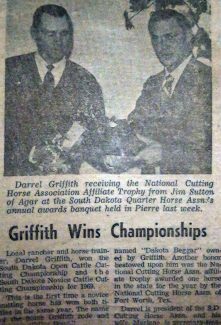 The Griffiths worked on putting together some of their own home-trained performance horses, and Darrel and Marlene made the decision to haul and show their own more competitively in 1969. Amongst their cavvy was a favorite of Marlene's, Miss Boog, a JB King and Peppy bred Palomino mare who brought home many honors in the AQHA Novice Cutting classes, as well as the NCHA Open, Affiliate, and Novice titles. Miss Boog went on to win the National High School Championship with daughter Terri aboard in 1974. Also in the trailer that year was a gelding named Dakota Begger, an Oklahoma Star, San Siemon bred horse, that vwon the 1969 senior reining and calf roping with Darrel. 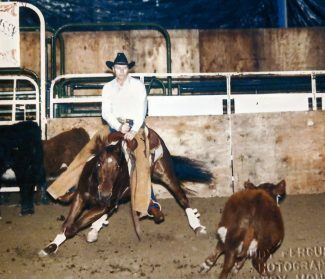 Poco Dismus, a mare raised by Wayne Copeland, earned AQHA points in the calf roping with Darrel and continued winning with Jim aboard in high school rodeo. In 1975, Darrel and Marlene were invited to Washington DC to perform cattle cutting demonstrations during the American Folklife Festival. Hosted by the Smithsonian Institute, Darrel and Terri cut on their horses twice a day on the lawn between the Washington Monument and the Lincoln Memorial. The committee erected an arena, provided cattle, and worked up the ground, only after Darrel told them cutting horses may have a hard time keeping their footing on the lush grass. People unfamiliar with livestock swarmed the horses from all sides, wanting to touch a real horse and a few times, young children grabbed their hind legs to give them a hug. Mounted Police escorted them back and forth from the arena to the stalls to make way for the horses through crowds safely. "One morning, the committee had decided to help by feeding the horses, so they cut a 55-gallon barrel in half and filled each half with oats. Luckily, we arrived shortly thereafter to remedy the situation," Marlene said. One year, Darrel offered one of their shared favorite horses to Marlene, a Quarter Horse gelding named Mister Frosty Clint, or as they called him, Frosty, or she had the option of getting a riding lawn mower. "I took Frosty," Marlene said. "But the next year, I got a riding lawn mower." Frosty, who went back to Doc Bar, their favorite lineage, was a kind, gentle horse who loved people. The pair found success in cuttings with competitors from area states, including winning the NCHA Area Six award and the $2,000 Limited Rider, something that she couldn't have done on the lawn mower. "A trainer in her own right, people would always ask to see Frosty's tricks that Marlene had taught him, including counting, kissing, bowing, and giving the biggest smile ever," Kissack said. Darrel and Marlene were involved in the SDQHA for approximately 40 years, meeting great people and making lifelong friends. Darrel served on the board of directors in the 1970s. Much of their success can be attributed to SDQHA. "Dad was known for putting such a nice, light handle on a horse and teaching them impeccable ground manners without being hard on one. I never saw him take out frustration on a horse he was riding," Kissack said. "He somehow knew just how much to ask of one and just when to quit so the horse kept progressing forward every day."